In addition to her accomplishments in securities litigation, Martis Alex also leads the Firm’s Consumer Protection Litigation Practice and was named by Benchmark Litigation as one of its Top 250 Women in Litigation for three years in a row. With more than 40 years of extensive litigation experience, Mark Arisohn focuses on prosecuting complex securities fraud cases on behalf of institutional investors, and he was recognized in securities for the sixth successive year. In the Firm’s Wilmington, Delaware office, Christine Azar was applauded for securing a $153.75 million settlement against Freeport-McMoRan Copper & Gold and Credit Suisse. Azar was also named one of Benchmark Litigation’s Top 250 Women in Litigation for three consecutive years. 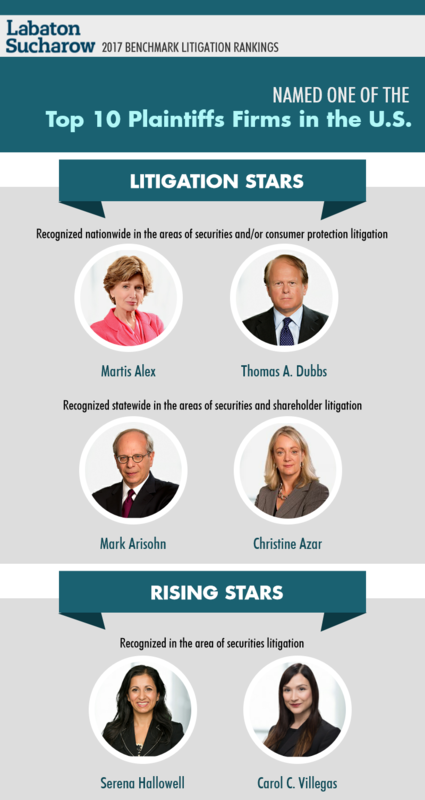 Benchmark Litigation’s inaugural Rising Stars list, which honors partners under 40 with a track record of accomplishments, featured Firm partners Serena Hallowell and Carol Villegas. Hallowell recently was instrumental in securing a $48 million recovery against retail pharmacy giant CVS. This year, she also helped secure a $41.5 million settlement against global telecommunications company NII Holdings, Inc. She also was one of the partners involved in securing a $140 million settlement against Barrick Gold, one of the largest gold mining companies in the world. Villegas played a key role in reaching favorable settlements of $15 million in a securities case against international retail apparel company Aeropostale, as well as $9 million in a case against healthcare communications provider Vocera. Her most recent argument in the case against Vocera resulted in a ruling from the bench, denying defendants’ motion to dismiss. Since 2008, Benchmark Litigation continues to be the only publication focusing exclusively on U.S. litigation. Rankings result from the culmination of a six-month research period in which Benchmark researchers conduct interviews with litigators and their clients, in which recent casework handled by the firms is examined and sources are asked to offer their professional opinions on the attorneys practicing within their state or national practice areas. For more information about Benchmark Litigation, please visit benchmarklitigation.com.